State Rep. Kymberly Pine, left, state Rep. Gene Ward, Jimmy Kuroiwa, Timon Tran and others launched the local campaign for Sen. John McCain's bid for the Republican nomination for president yesterday in front of the Vietnam Memorial on the state Capitol grounds. 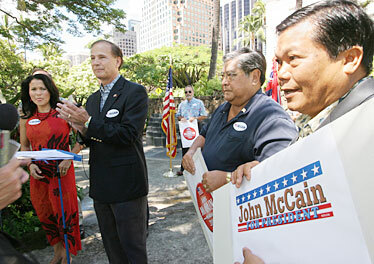 Hawaii supporters of U.S. Sen. John McCain's presidential bid formally launched his campaign in the islands yesterday. "America's always looking for heroes," said state Rep. Gene Ward (R, Kalama Valley-Hawaii Kai), a co-chairman of the McCain campaign in Hawaii. "Today we want to present the American hero, John McCain." Supporters touted McCain, a former prisoner of war in Vietnam, as being a candidate who best understands how to bring an end to the war in Iraq. "I think we all want to end this war," said state Rep. Kymberly Pine (R, Ewa Beach-Iroquois Point), campaign co-chairwoman. "Only John McCain can do it right -- with honor and in a way that will place America in history as a country that succeeded in getting out of this war and keeping America safe." Ward and others said they have inquired about having McCain visit Hawaii but have been told that his schedule does not allow it at this time. McCain received $15,690 from donors in Hawaii through the first six months of 2007. The Hawaii campaign did not have updated figures yesterday. McCain's father, Adm. John S. McCain Jr., was the Hawaii-based commander in chief of Pacific forces from July 1968 to September 1972, during which time the younger McCain, a Navy pilot, was a prisoner in the infamous Hanoi Hilton in North Vietnam. Among the prisoners there was Jerry Coffee, who ran last year as a Republican against U.S. Sen. Daniel Akaka. He dropped out of the race for health reasons. Coffee, a retired Navy captain and McCain supporter, was not at the local campaign launch yesterday.